Parents of a baby born with loose hip problems may find daily life overwhelming. Fortunately, medical treatments and the use of accessories and equipment may help doctors achieve proper placement of the hip over time. A loose hip or dysplasia occurs when a baby is born with a malformed femur or leg bone that fails to connect with the hip socket, or when the hip socket itself is malformed. The most widely-used terms to describe the condition are developmental dysplasia of the hip (DDH) and rarely, congenital hip dislocation (CHD). Monitoring for DDH is an important part of newborn baby health care. If left untreated, a baby born with loose hips may experience mobility difficulties throughout his lifetime. DDH is an ongoing condition that may go undetected at birth. DDH complications include thigh bone twisting, hip socket abnormalities, and muscle contractures. Normal hips at birth may experience malformations in later stages of physical development. Regular examinations may prevent future abnormalities in otherwise normal infants. 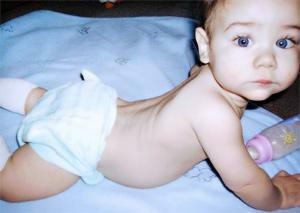 One in about 1,000 newborns have unstable hips at birth. Female infants suffer DDH more than boys at a ratio of nine to one. About 60% of children who experience DDH are firstborn. About 20% of infant DDH patients are presented in the breech position. It's crucial for new parents to remember that despite advancements in medical technology, hip problems remain hard to detect in some cases and may occur after the birth of their child. If you suspect something isn't right about your baby's legs or hips, speak with your family physician and arrange an initial examination right away. Physicians rely on a series of diagnostic or screening procedures for early detection and prevention of a baby born with loose hips. Take a look at the most common diagnostic dysplasia tests your doctor may use to diagnose DDH. Using the Barlow test, the pediatrician will gently try to push the hip bone out of the socket. The Ortolani test works on infants from one to two months old when tissue is still pliable and the doctor can feel a loose hip pop back into place. Doctors routinely inspect infant thigh creases, which should remain symmetrical in normal hips. Unequal leg length and uneven knee positions (side-to-side) may mean dysplasia. After the screening steps above, most doctors use x-ray and ultrasound tools to confirm a DDH diagnosis. Early Infancy: As with most conditions, early diagnosis plays a large part in treatment plans. If diagnosed at birth, your infant may need special equipment to hold the leg, knee, and hip in specific positions for a couple of months. The most common equipment includes the Pavlik harness and the Frejka splint, which help tighten ligaments and speed normal hip socket formation. One to Six Months: At this age, actual hip dislocations sometimes develop from loose hips. In the case of a dislocation, physicians again turn to methods like the Pavlik harness, which presses the head of the hip bone in the socket's direction. Success rates for the Pavlik harness stand at approximately 95%. In extreme cases, surgical closed reduction surgery under general anesthetics may be necessary. Eighteen Months and Older: By this time in a baby's life, the progressive deformities associated with developmentally loose hips may require open surgery to realign the child's hip and socket. If you believe you have a baby born with loose hip problems, don't waste a single moment. Early intervention remains the best tool to prevent complications like pain, abnormal gait, and osteoarthritis. To learn more about DDH and CDH, consult with your baby's pediatrician or check out the resources listed here.